Another year has slipped away and memories of Y2K have become distant as the first decade of the 21st Century has almost passed. As we mark this moment, I want to take a look back at how we in the kite world have progressed to this exciting time; kite surfing a mainstream sport, resurgence of kite cultures throughout Southeast Asia, talk of “mega-kite-shows,” and real possibilities of significant kite power on land and water. 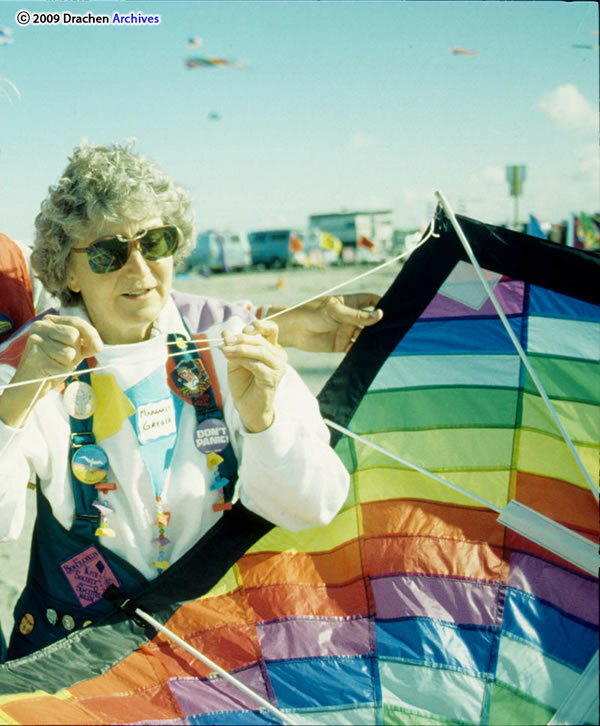 For most of us baby-boomers, we were influenced by an “old guard” of kiteflyers, a group predominately from the WWII-era “greatest generation.” Can you imagine the raised eyebrows of their peers, when in the 1950’s or 1960’s these pioneers went out to fly kites? 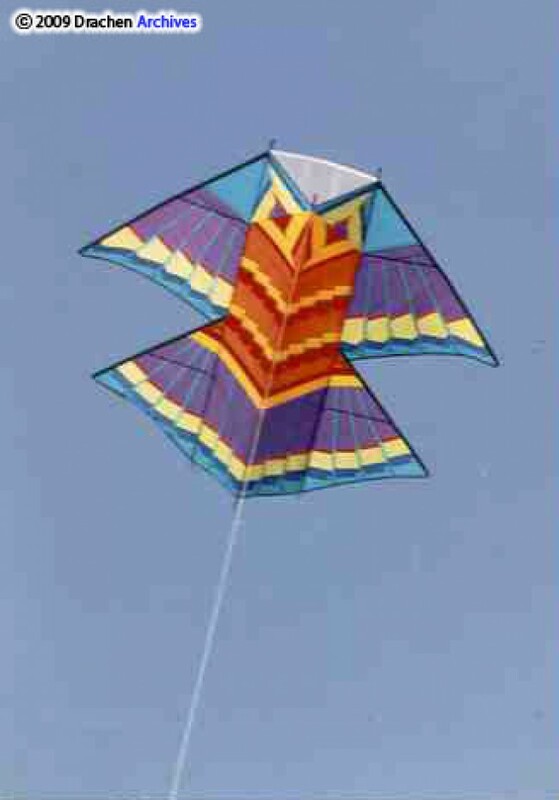 Here in the US, we remember Domina Jalbert, Francis Rogallo, Paul Garber and other national figures, but there was a whole cadre of kite people who influenced me and my contemporaries. 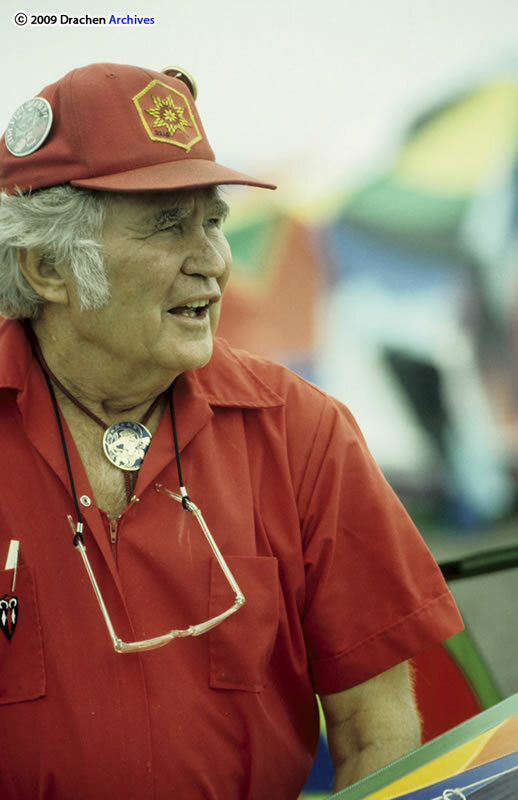 I’d like to offer some remembrances of people who had serious influence on my kite life, and ask that you take a moment to remember others who might have guided you. My first international trip for the specific purpose of flying and seeing kites was with Dave in 1988. 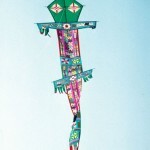 I had been involved with kites for over ten years by then, but had very little hands-on knowledge of ethnic kites. The trip to China changed everything! 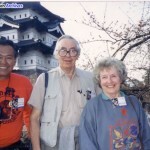 Dave led kite excursions to Japan and China for many years throughout the 1970s and 1980s and introduced countless people to the magic of Asia and its kite traditions. 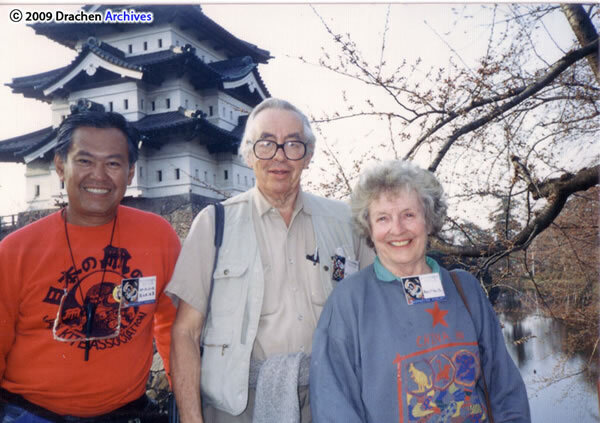 On that trip in 1988, among others, there was a “retired” actress, Gloria Stuart, who had traveled with Checkley to Japan in the mid-70s. Gloria became famous again when she was nominated for an Oscar for her performance in “Titanic,” but she had carried on a love affair with kites since before WWII! Checkley was an active member in the fledgling early years of the AKA, virtually hosting the annual convention at his Seattle home in 1982. 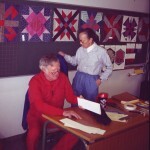 Sadly for the American kiting family, Dave passed in early 1989 while planning another trip to Japan. 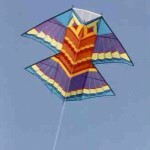 When I started flying kites in the mid-1970s, I hardly thought I’d ever have to make my own. There were just so many options available – Sky Zoo kites, Vertical Visuals, White Bird kites, the Nantucket Kiteman – why would I ever have to make a kite for myself? That question was answered in 1984 when I attended my first AKA annual Convention. Now my eyes were open to all the kite makers who were making their own creations, far away from prying eyes. I met peers, like Rick Kinnaird and his mythical BST, Doug Hagaman with his Giant Red Parafoil and Scott Spencer, master of the snowflake. But I also met many of that greatest generation; Bob Ingraham, Tony Cyphert, Ed Grauel, and others. Somewhere along the way I met a very retiring lady, Margaret Gregor, whose, Kites for Everyone contained concise building information and flawless designs for a variety of kites. 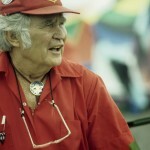 Margaret used input from many of the “old guard” kite makers (Len Conover and Ed Grauel) but also introduced us to the likes of Lee Toy, and Steve Sutton, both who would have a profound effect on American kiting (Count the Sutton Flowforms at any major kite festival, or ask any kite artist who first pushed him toward art kites). 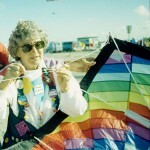 Margaret was a bridge from the kiting’s older generation to today’s kite maker and workshop presenter. Her efficient uses of materials and foolproof designs are still the standard for elementary kite education. It’s not fair, but I can never speak about just Betty, or just Bill; it’s always Bill and Betty, together, a team! With ten years of the Junction, Texas, kite retreat, they raised the bar on kite education, inviting local and international artists to inspire and conspire to greatness. As art educators, their emphasis was upon creativity and originality and they were (and still are) respected mentors for all of us who call them friend. Betty and Bill’s influence is still being felt. 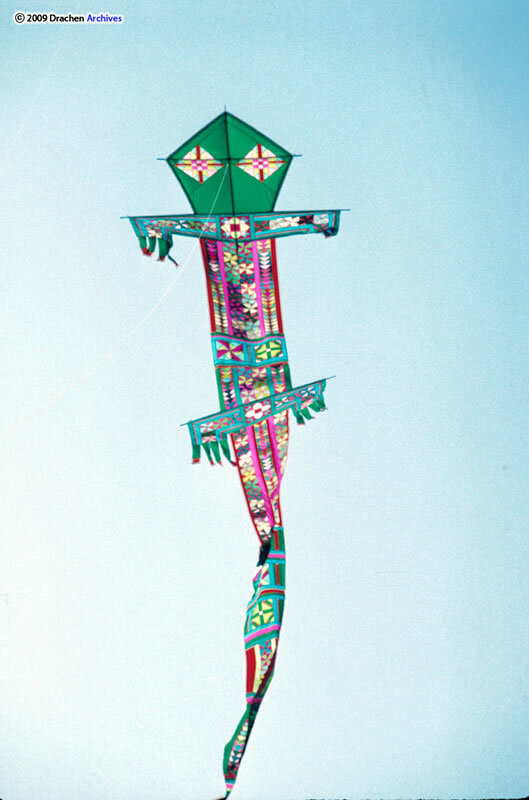 They were active travelers in the late 1970s and early 1980s and documented kite festivals with photographs and collected kites. 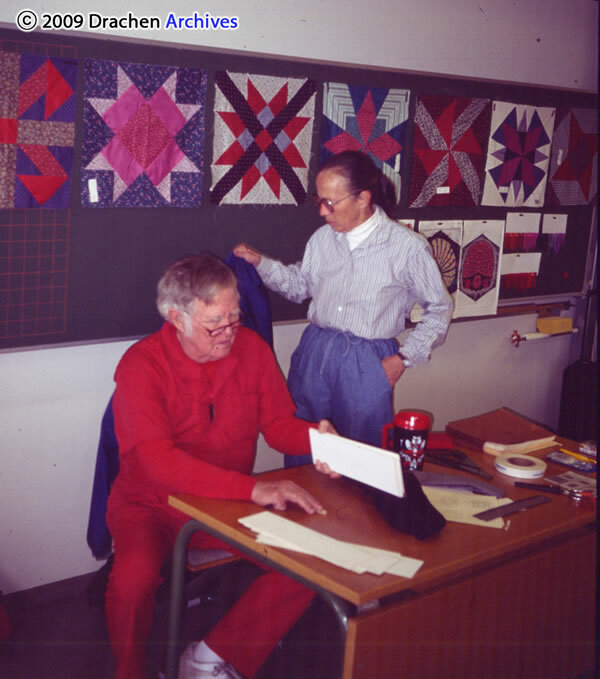 Both have donated their kite collections, their slides and photographs, and their kite libraries to the Drachen Foundation so they can remain accessible to the active kite community. Finally, they also leave a wonderful legacy of their own beautiful kites, patchwork masterpieces that I was instantly drawn to back at my second AKA Convention in 1985. Here was someone else using patchwork techniques and ideas that I had no idea existed! How lucky for me that they became such good friends and trusted advisors. This entry was posted in 2009, Drachen, Issue 64 (Jan/Feb), Kite Columns, KL Archive and tagged drachen, people.